I wrote a post about this a bit ago, but thought I’d touch on it again. I want to be wholly devoted. I want to be “all for Jesus,” as so many in the history of Christianity seem to have been. But I find in myself a bent toward distraction, even in the very moments I’m kneeling to pray, intentionally taking time to read the scriptures, or stopping to ponder a significant life issue in light of God’s truth. Distraction is both a natural part of life AND an indication of the state of my needy heart. I am human, therefore I am distracted… and it’s exactly BECAUSE I am human, that I am in need. 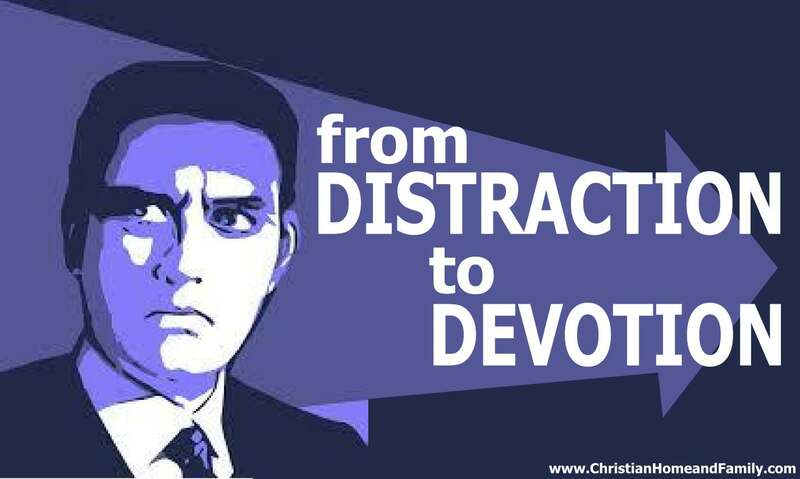 The distraction shows me that fact, and by God’s grace, drives me toward devotion to Christ. What does that mean? God had directly revealed mind-blowing spiritual truths to him. He had a taste of heavenly knowledge, given to him personally. Because of that privilege, the LORD Himself determined that Paul needed something to keep him from becoming conceited. Don’t cluck your tongue just yet. It’s in our nature (yours and mine, as well as Paul’s) to think much of ourselves when we’re given an honored position or special perk. It’s not only a tendency, it’s a danger. Pride is a killer, and we like Paul could easily be killed by it if we were singled-out and given such amazing revelations of God’s truth. So God provided Paul with an unusual gift… a “messenger of Satan” to “harass” him. There’s all kinds of debate whether this was an actual demonic messenger, a physical malady that Paul characterized as a demon, or something else. But all of that misses the point. God helped Paul out by giving him this thing, this unsettling, humbling thing that kept him from becoming conceited. I wonder if our “distraction” problem is serving the same purpose? How often have YOU cried out to God about your distraction? Me? At least 50 times. Probably more. I have cursed it, asked God to take it, prayed for greater ability to focus, stay on track, and keep my heart set on Him. But my distraction problem remains. God told Paul to get used to it, because his “thorn” wasn’t going anywhere. It was there on purpose, to serve him, to keep him from exalting himself. God gives good gifts, even when they don’t look “good” to us. They are good FOR us, maybe like a vaccination… painful at first, but working a greater, more long-term good that we don’t even realize we need. Could the tendency toward distraction be that for us? Paul implemented an attitude shift, based on the reality that his “thorn” was actually a gift. When Paul realized that at the very point of his weakness, God would pour His strength into his life, everything changed. No longer was the thorn a curse, it was a blessing. Wow. That’s a mind-blower. The frustrating distractions we deal with day after day in our efforts to be devoted to God are actually blessings directly from His hand. Why would we try to free ourselves from something that God Himself says is a blessing? Can you see your proneness toward distraction as a blessing, rather than a curse? Can you see that it could be God’s gift to you, to keep you dependent on Him? The power of Christ rested on Paul when he was able to accept the blessing of his own weakness. It’s in our weakness that we realize our need for God to be our strength. It’s in our weakness that Christ is seen as ultimately strong. It’s in our weakness that Christ does what only He can do, in us, and through us. The Apostle Paul is one of the primary heroes of the New Testament. Most every Christian I know wishes they could be like Paul. But do we really mean that? Are we willing to submit ourselves to the things that MADE Paul the man of God that he was? Paul knew that for Christ to work powerfully in his life, he had to accept all that Christ brought into his life. That is humility. It’s what brings us low, but lifts Christ high. It’s what brings the power of God on-line in our lives. are you willing to become humble before God (1 Peter 5:5-6)? Are you willing to take on the attitude of a servant, ready to bless, willing to give, prepared to serve lives instead of insisting that they serve yours?